Over the past few weeks, we’ve been compiling a host of gift guides to help you with your Christmas shopping. Here is a list of 10 of our best recommendations for ethical and sustainable gift-giving. You can find more ideas by browsing the collections below, including a range of reusable shopping bags and Readings exclusive keep cups. A Zero Waste Life is the ultimate guide to radically reducing your waste, without losing your lifestyle. In her 30-day challenge, Anita Vandyke demonstrates how to make sustainable, ethical choices when it comes to shopping, eating, travel, beauty and more. Small changes can make a big difference, and by following these easy, creative steps we can all do more to save our world. This is the perfect guide for fashion lovers keen to embrace a more ethical and environment-friendly approach to their wardrobes. The book is divided into four chapters (Buy, Wear, Care, Dispose) with each containing practical tips and illustrated case studies. There’s also a rich reference section at the end featuring lots of further resources to explore. Designed to be read with a pot of tea by your elbow and a notebook beside you, this gorgeous book is all you need to start living a more home-grown life. From DIY projects to wild fermented recipes, the in-depth knowledge and hands-on instruction contained in these pages will have your whole family fascinated and inspired to get growing, keeping, cooking and making. In a world where suburban nature is declining and diversity is shrinking, Habitat is a practical guide for those who want to encourage insects, reptiles, frogs, birds and animals into their garden. Author AB Bishop is a highly respected horticulturist, conservationist and habitat consultant with a wealth of experience that she brings to the page. Wilderness: Celebrating Australia’s protected places is a limited edition coffee table book from the Wilderness Society, filled with breathtaking photographs of the places that they have campaigned to protect for over 40 years. Funds raised from the book sales will go towards the Wilderness Society’s ongoing work to protect Tasmania’s wild places. Samuel Johnson OAM has compiled this wicked, witty and warm-hearted anthology of letters to Santa, all written by a cross-section of Australia’s best writers, comics, actors, artists, musicians and personalities. Shaun Tan provides illustrations and contributors include Helen Garner, Deborah Mailman, Shaun Micallef, and many more. Plus, every copy of Dear Santa sold will also contribute to cancer research. Australia is a prosperous country, but there are pockets of disadvantage everywhere. The Hope Prize encourages writing that transcends stereotypes of ‘the poor’, and these 10 short stories reflect the tenacity and optimism that people show in the face of poverty and testing times. Hope Shines is a moving collection and a celebration of hope and the enduring power of community. Royalties from the sale of this book will be donated to the Hope Prize. Behrouz Boochani is a Kurdish journalist who has been held in the Manus Island offshore processing centre since 2013. 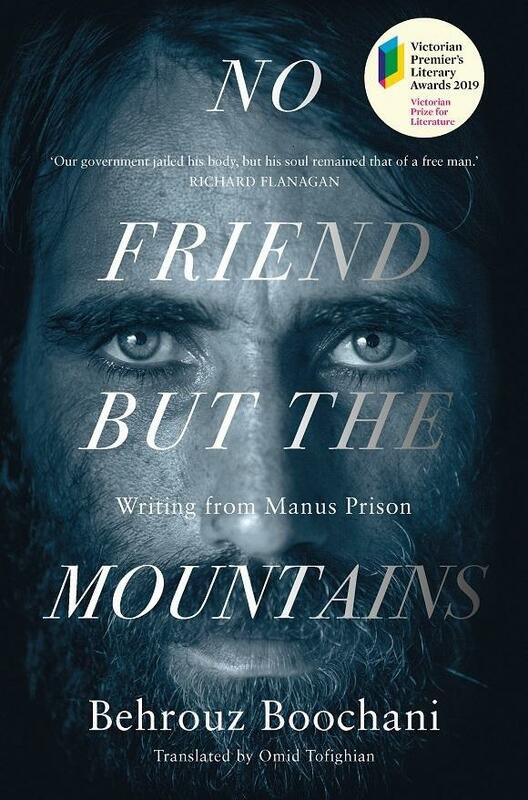 Laboriously tapped out on a mobile phone, No Friend But the Mountains is his powerful and vivid account of life in one of Australia’s refugee detention camps. It is a cry of resistance, and a vivid portrait through five years of incarceration and exile. Rise & Resist is an empowering and practical call-to-action. Crossing the globe, Clare Press meets passionate change-makers working towards environmental and social justice, and shares examples from their communities from eco warriors and zero wasters, to knitting nannas and introvert craftivists. You can listen to an interview about with Press discussing the book on the Readings Podcast. Yuval Noah Harari is the bestselling author of Sapiens and Homo Deus. In this latest work, he explores what it means to be human in the modern world through 21 bite-sized lessons. The central thread running through his exhilarating new book is the challenge of maintaining our collective and individual focus in the face of constant and disorienting change. For the originals, inventive and lighthearted. Enjoy your favourite brew, a herbal tea, or something over ice in the World’s first Barista standard reusable cup. Designed for pure drinking pleasure on the go.